Contemporary art exhibition, Arcade, from local collective, Knock Knock Contemporary Artists’ Initiative, opens this month at Canopy Art Centre in the CBD. This new show highlights the complex relationship between art, artists and the art of making money. The official launch is at 6pm on Friday 28 October. Seven well-known Cairns artists: Raewyn Biggs, Barbara Dover, Louisa Ennis-Thomas, Vide Freiberg, Julie Poulsen, Rose Rigley and Jennifer Valmadre have created works responding to this challenging exhibition theme. ‘Some works in the exhibition highlight individual artists’ approaches to creating commercial versus non-commercial works within their practice. The artists have created two contrasting bodies of work, demonstrating works of commercial success alongside works which are often more playful or challenging. Other members of the artist group explore the tensions between art, money and production. Arcade gives a behind-the-scenes look at how artists tackle the difficult issue of making art pay - or not - as the case may be’, explains Arcade co-curator, Louisa Ennis-Thomas. Painting, sculpture, jewellery and ceramics sit alongside more conceptual installations and works which encourage audience participation and artist-to-artist collaboration. An artist forum ‘Making Art Pay – Or Not?’ will be hosted at the gallery on Saturday 29 October, encouraging discussion of the issues raised by the exhibition. All are welcome to attend. Be warned - as the name suggests - Arcade offers the temptation to purchase an original artwork or two for your collection and a unique opportunity to reflect upon the art of consumption. Arcade will be on display at Canopy Art Centre until Sunday 13 November. Knock Knock Contemporary Artists’ Initiative is a cooperative venture formed in 2010 in a commitment to enhancing Cairns vibrant arts community. 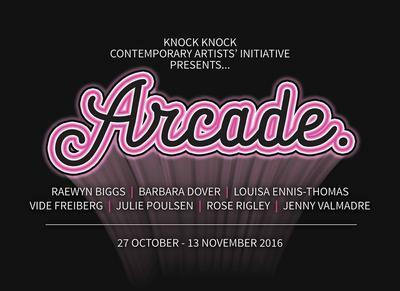 Knock Knock aims to invigorate the contemporary arts scene through an on-going exhibition programme run by artists for artists. Knock Knock is a dynamic group of artists who came together in their pursuit of further training and professional development within their own art practices. The name Knock Knock eventuated as a catchy phrase for access and open doors for up-coming and established local artists. Knock Knock has a strong focus on growing grassroots exhibition opportunities in the Cairns region; access to professional development and training for visual artists; developing creative partnerships within the broader community and generally supporting innovation in contemporary visual arts. The group’s vision is to contribute to building Cairns’ identity as an arts destination.